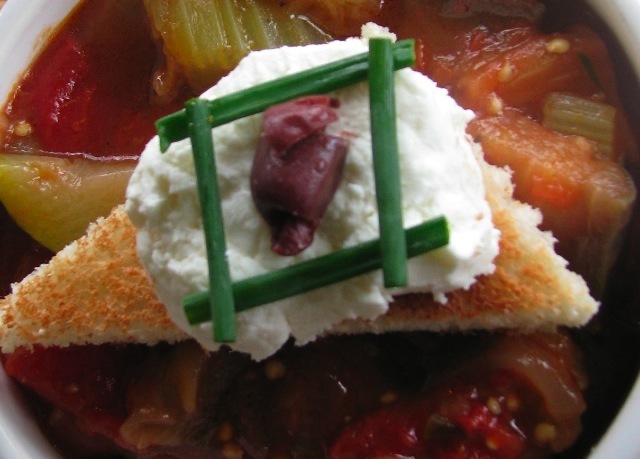 France and Italy both have their own version of what the French call Ratatouille, called bandiera in Italy. which means flag, probably because of the mixture of all the different vegetables that makes it a very colorful dish. It seems like bandiera was born in Italy in the Umbria region, it then spread all over the country. In France it comes from the Provence-Cote d’Azur region, where they produce and consume quite a lot of tomatoes, eggplants, and peppers. basically, each region eat what they produce which makes sense. The traditional French and Italian recipes are slightly different but both have red peppers in it. This is my version of the ratatouille which I made somehow spicy and served with a toast of goat cheese and kalamata olives. Ratatouille can be served in so many different ways, as a side dish with fish or poultry, for vegetarians they can serve it with rice, or any other types of grains, which makes it a quite versatile dish. You can just use your imagination and make your own version of it. The traditional French recipe is cooked for a long time, at slow heat for many hours, the result is an extremely flavorful dish that looks and tastes more like a vegetable compote. Capers and olives are optional, you can add them if you like them. Slice the onions and brown them in olive oil (make sure to get a top quality fruity olive oil) then add the crushed garlic, but be careful not to burn it. Cut all the vegetables in cubes. Add first the red peppers, cook and stir for 5 minutes, then add the zucchini, stir for another couple of minutes, then add the eggplants and the celeri, then the tomatoes. Add the basil, salt and pepper. It needs to cook covered for at least two hours. This entry was posted by silvia on December 8, 2008 at 4:53 pm, and is filed under Vegetables. Follow any responses to this post through RSS 2.0.You can leave a response or trackback from your own site.